So, I trust by now you know what’s going on with regular triangles, and with angles in general. Right triangles get a post all to themselves because they’re special, and have some rules of their very own. Let’s dig in, shall we? First, let’s briefly review the Pythagorean theorem. You know this, yes? In the figure above, AC = 6, BC = 10, and CM = 2√13. If N is the midpoint of AC, what is BM + MN? OK, we’ve got BM now…it’s 8 – 4 = 4. Easy. How do we find MN? Help us Pythagoras, you’re our only hope! So our answer is 5 + 4 = 9. That’s choice (D). Ain’t no thang. Now, are you ready for some amazing news? Even though you should absolutely know the Pythagorean theorem inside out, you actually don’t have to use it very often on the SAT provided you know the 4 special right triangles. FOUR? But they only give me two at the beginning of each section! Hell yes, son. I’mma give you some extra ones. You’re welcome. These are the two you’re given at the beginning of every math section: the 45°-45°-90° (AKA isosceles right) and the 30°-60°-90° triangles. Know these ratios cold…you’ll need them. Note: my diagrams above and below are not to scale. …And these are the two you aren’t given on the SAT. There’s nothing worth saying about the angles; don’t worry about them. What’s important are the sides. 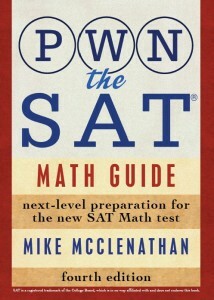 Because the SAT aims to be a “calculator optional” test, it has a strong predilection towards “easy” numbers. There aren’t that many* sets of integers that work nicely in the Pythagorean theorem with each other, but these two (and all their multiples) do. We call these Pythagorean Triples, and you’ll be seeing a TON of them on the SAT. Note that we saw the 3-4-5 (and its big brother the 6-8-10) in the example problem above. It’s not necessary to know these, but quick recognition of them will save you 30 seconds of work old-Greek-guy work. This is the kind of thing I’m always talking about: pattern recognition and the use of that knowledge to excel at this test. And that’s it! That’s really all you need to know about right triangles. * Note: there are actually a bunch of Pythagorean triples. See a partial list here. But for the purposes of the calculator optional SAT, you needn’t worry about all of them. I’ve just highlighted the ones that appear on the test commonly. How would you do #20? Hint (ask again if this doesn’t help): Make an equilateral triangle from the centers of the circles. Step 1: Draw triangle ABC. Note that, since the circles all have the same radius, ABC is equilateral, which means all its angles measure 60º. Step 2: Draw segment OB. Note that you’ve just created two 30º-60º-90º triangles, each of which has segment OB as its longer leg. Step 3: Since OB = 18, you can calculate the other sides of the 30º-60º-90º triangles. The short legs measure 18/(√3), and the hypotenuses measure twice that: 36/(√3). The one we really care about is the short leg, because that’s also the radius of one of the circles! Step 4: We want the area of one of the circles. We’ve got a radius now, so we just need to throw it in the formula! In this case, you know that the larger triangle, ABC, is equilateral, because each side is equal to 2 radii. Because of that, all the sides are equal, and all the angles are 60º. That means when you drop the vertical down from B to O and create a right angle, you’ve made 2 30º-60º-90º triangles. Just curious. Let’s say I have a 45-45-90 triangle and both of the legs have lengths of 2√ ̅2, but I’m trying to find the hypotenuse. Isn’t the hypotenuse suppose to be the side with the radical sign? Good question. The legs can be anything, really. The hypotenuse usually has a √2 in it because it’s the leg multiplied by √2, but if the legs already have a √2 in them, multiplying by another √2 will cancel them out. So if the legs are 2√2, then the hypotenuse would be (2√2)(√2) = 4. Remember that the x:x:x√2 ratio comes from the Pythagorean Theorem, so you can always use that to check if you’re stuck or confused. Are you a Math god or something?! Thanks! I can’t make complete sense of number 18, would you explain it? The trick here is that the question’s basically telling you that, hypotenuse squared minus leg squared is x^2 – 2xy + y^2. But from Pythagoras, you also know that hypotenuse squared minus leg squared equals other leg squared. So basically, the square of the leg is x^2 – 2xy + y^2. If you recognize that as the binomial squared that it is (it’s (x – y)^2, you arrive at the answer. Is there any trick to remembering that is can be simplified into (x-y)^2 ? Try finding the area of the whole big triangle and then subtracting the area of the unshaded triangles. Be on the lookout for Pythagorean triples! This problem is FULL of 5-12-13s. How did I not see that? I’ve been cramming for my SAT test since last year, so this is really helping me 😀 If only I was half as smart as you! Hi, so for #18 in drill 2 I think there is something wrong with the way I understood it because if you told us that AB=2 and AC=2, how can this be as AC is the hypotenuse ? Other than that I really can’t understand the question.. Would you please explain it to me? Careful–AC doesn’t equal 2, it equals 2√2. Does that help? How do I find AB in #16? nevermind I wasn’t thinking right for whatever reason. I’ll know now though.